From a tiny group of Germanic bands to the mightiest governmental system the world had ever known - what caused the momentous rise of the European states? Drawing on Toynbee's theory of civilizations, Victor Lee Burke develops an account of the origins and transformation of governments in Europe between the eighth and seventeenth centuries. Borrowing also from Charles Tilly's and Anthony Giddens's works, he shows the importance of wars in the rise of the European state system. Burke provides a panoramic sociological history of the rise of European states. He relates the origins and development of European governments to the social conflict among the European, Viking, Islamic, Byzantine, Ottoman, and Mongol civilizations. He assesses the impact of the Crusades on the rise of the monarchy and the origins of democratic regimes. In contrast to European-centred interpretations of history, the author argues that the conflict among other civilizations forged the rise and growth of Western European governments. The book will appeal to advanced undergraduate students and academics across all social sciences and particularly in political and economic sociology, social and political theory, European studies and Western civilization. 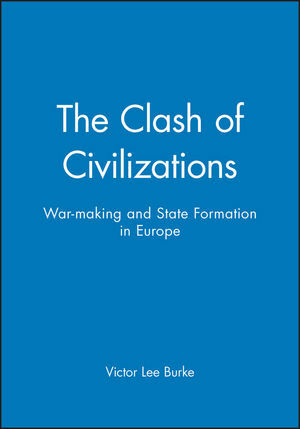 Victor Lee Burke is the author of The Clash of Civilizations: War-making and State Formation in Europe, published by Wiley. 1. A Theory of the Modern European State System. 2. Early Foundations of Western European Civilization. 3. Early Feudalism and Competing Civilizations. 4. The Manor and Church: Internal and External Conflict. 5. The Renaissance, the Reformation and the European State System. 6. The Findings and their Implications for the Americas. * Analyses the reasons for the rise of the West as the dominant world civilization. * Develops a novel account of the role of the clash of civilisations in history. * Incorporates sociological thinking into historical research.